Makeup to Make Your Eyes Pop! If you're looking for a way to bring out the best in your eyes, try these makeup tips! Theyâ€™re the windows to our souls and a great facial feature so make sure your eyes look their best with these easy makeup tips to make your eyes pop! 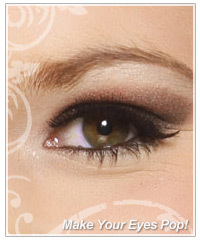 A makeup look for your eyes begins with eye shadow! While a subtle, natural eye will work for any situation, to really make your eyes the focus of your face and centre of attention, try a contrasting eye shadow matched to the color of your eyes. Brown eyes - try shades of green and pink. Blue eyes - deep plums and purples. Green eyes - light purple eye shadows (think lavender hues). Curling your lashes will open up your eye and create a feminine finish so use an eyelash curler to give your top lashes some oomph. Once youâ€™ve applied your eye shadow and curled your lashes, add at least three coats of mascara in the darkest color you can find. To further define your eyes, add a line of black eyeliner underneath or on the rim (depending on your preference) of your lower eyelashes. To finish your eye popping look, get your hands on some silver colored eye shadow (can be loose powder, crÃ¨me or pencil) and smudge some into the inner corner of each eye. This will add a highlight to your eye and bring all of the elements of your eye makeup together!